Dad is really getting lucky with the weather. Another morning without rain, and even some sunshine! We pulled out of Warm Springs Bay fairly early, had a quick breakfast on our way out of the bay, and throttled up and headed south. The trip down to Red Bluff Bay is only 15 nm or so, and an easy ride given the wind is from the north. Chatham Strait isn’t calm, but the C-Dory does much better with following seas than head seas and makes light work of the 3 footers rolling beneath us. We pulled into Waterfall Cove and checked it out briefly on the way down. Good protection from the south, but not from the north. Soon after leaving Waterfall Cove the seas die down completely and stay calm until we get to Red Bluff Bay. As we approached Red Bluff Bay the reason for the name became obvious. A giant, dark red outcropping of rocks looms over the water unlike any rock I’ve seen this trip. 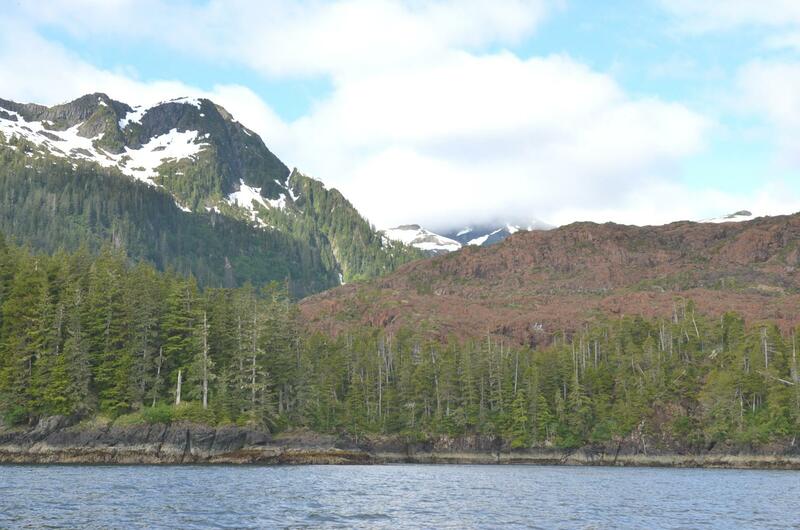 Red Bluff Bay is truly spectacular. 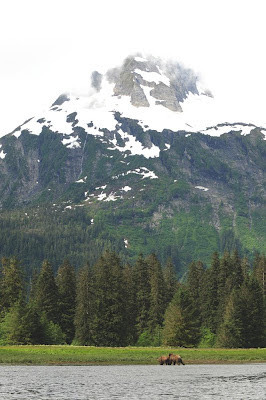 Grassy tidelands give way to sheer cliffs and then to towering peaks covered in snow. A huge waterfall tumbles down a mountain on one side of the bay. When we arrived, a couple of brown bears were ambling through the grass, filling their stomachs between hibernations. Hans and Terri from Mellow Moments were already anchored in the bay, and we dropped the hook nearby. 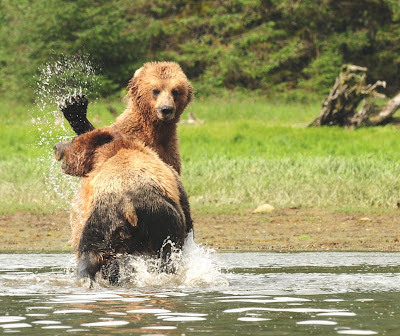 They had come in the day before and reported exceptional bear watching. Not wanting to miss the opportunity for watching bears in the sun, I grabbed my camera and hopped in the kayak soon after arriving and paddled to the head of the bay. I wasn’t disappointed. 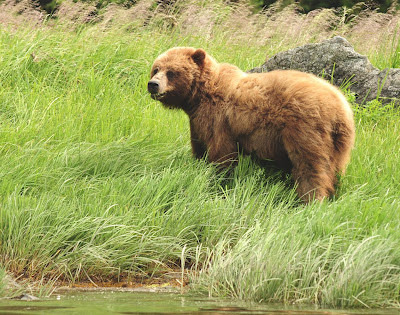 Two brown bears were walking around together. It looked like they were playing. I paddled through the shallow water and got a closer look. The two bears were jumping around and chasing and biting each other. They looked at me a few times, but seemed completely unconcerned with my presence. I felt badly that dad was missing out on this show back on the boat. Sure, he could watch through binoculars, but it’s not the same. 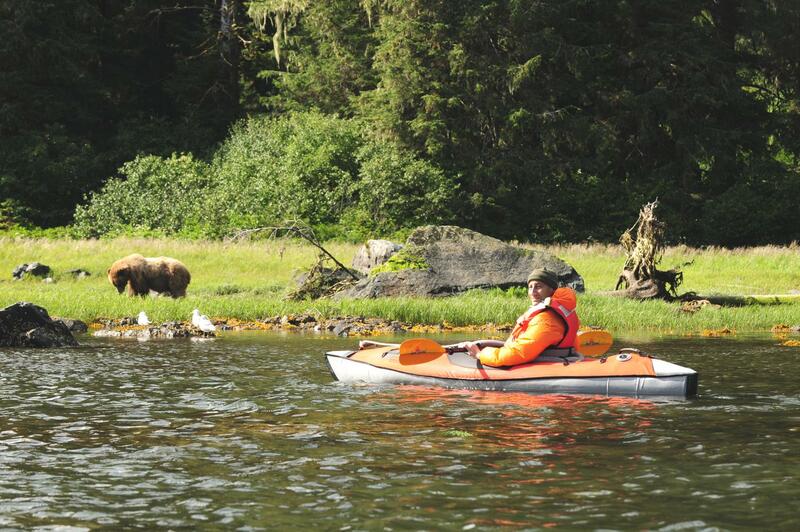 I thought about paddling back and giving him the kayak to use, but I was really enjoying watching the bears. A few minutes later, I turned around and saw Hans and Terri heading towards the bears in their dinghy. 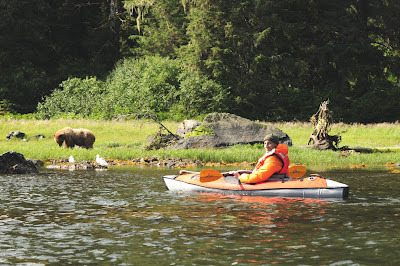 Sure enough, they had swung by our boat and picked up dad on their way in so he too could watch the bears. I paddled out to their tender and switched places with dad. 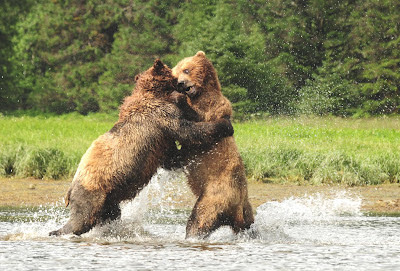 The bears continued playing—or mating, perhaps—for another 20 minutes at least. When they were done, we watched another bear for 30 minutes more. 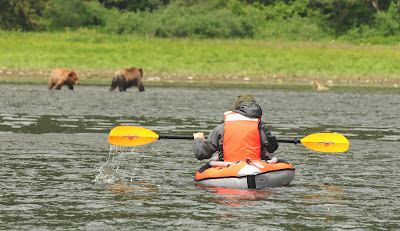 While we were watching the bears Hans and Terri invited us over for dinner and offered to lend us one of their kayaks so dad and I could go exploring together. How nice! After the morning bear watching we headed back to the boat for lunch, then relaxed in the sun and read for a while. 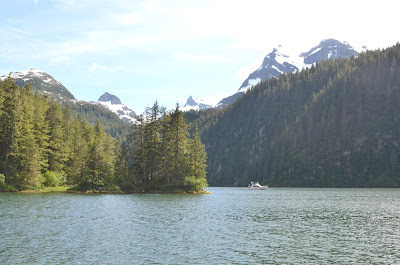 By mid afternoon we were ready to see the bears again, and I paddled over to Mellow Moments and borrowed a kayak, headed back to our boat to pick dad up, then headed up to the head of the bay to see the bears. We saw a whole bunch more bears, including a mom with three little ones. Watching all these bears is surely a highlight of the trip. We got back to the boat and relaxed for a few minutes before heading over to Mellow Moments for dinner. Another bear was eating dinner on shore just behind Mellow Moments, and we got a terrific view of him from the flying bridge. We had a nice dinner with good company and got back to the boat around 9:30, tired after a busy day! 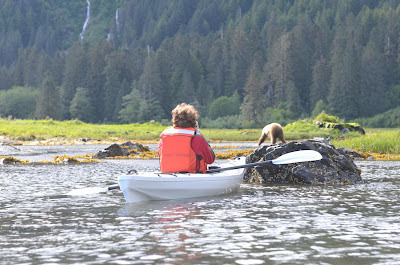 Thanks to Hans and Terri for dinner, the tender ride to see the bears, and the kayak! Red Bluff Bay was so nice today that we’ll stay tomorrow as well. Great images! Wonderful narration! Thanks for sharing this with us.